Maximum size: 250 mm (Tina Owens, Sea Slug Forum). Identification: This is a broad, firm species with clusters of prominent, irregular tubercles on the notum. The central tubercle in each cluster is usually circled by a single irregular ring of smaller tubercles. It is light tan to violet-brown and may have dark brown patches between the clusters of tubercles. Irregular lighter patches may occasionally be present on the notum. In young animals, the tubercles are less complex and are separated by more prominent dark brown or black pigment. It can be distinguished from Dendrodoris tuberculosa by its opaque notum, less elaborate tubercles and lack of white spots on its underside. Distribution: Big Island, Maui, Lanai and Oahu: widely distributed in the Indo-Pacific; also in the eastern Pacific. 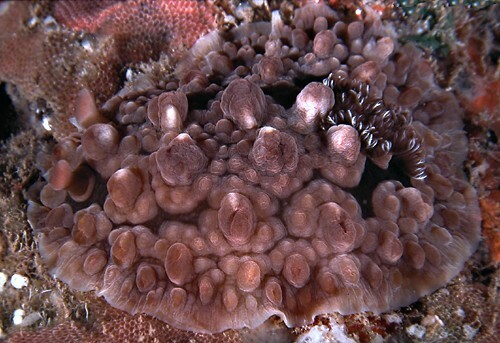 Taxonomic notes: The first photo labeled Dendrodoris tuberculosa in Bertsch & Johnson, 1981 is this species. It was first recorded in Hawaii at Pupukea, Oahu by Scott Johnson on Sept. 19, 1978. However, it seems possible that Doris rugosa Pease, 1860 is a synonym of this species rather than of Dendrodoris tuberculosa as suggested in Kay, 1979. In that case, it was first reported from Hawaii in Pease, 1860. Photo: Mike Severns: 61 mm: Ahihi Bay, Maui; Nov. 11, 1987. Note 1: This difference may be due to the fact that we haven't spent as much time working at exposed sites on Maui. Note 2: Painful irritation of the eyes and lips after rubbing with the mucus has been reported by Ian Loch (as quoted on the Sea Slug Forum). Scott Johnson also reported a possible reaction (pers. com. ).